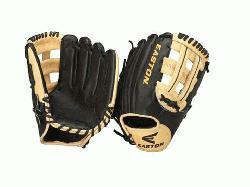 Easton Pro Baseball Glove EPG51BW 11.75 inch (Right Handed Throw) : Easton Professional Series baseball gloves from Easton are the product of quality craftsmanship and are meant to be worn by serious ball players. These gloves start out as high quality USA steer hide and are Japanese tanned into professional grade Okayama leather. 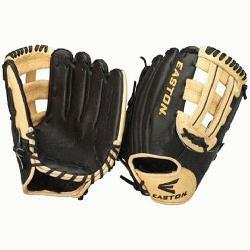 The result is a soft, smooth, and incredibly durable ball glove. The inside of these gloves is made from Pro Fit steer hide which is built soft for comfort, yet strong for the rigors of professional level play. The gloves are held together by professional grade USA-tanned rawhide lace that is tested to a tensile strength of 100 lbs! That means that the chance of the laces on these gloves breaking is slim to none. This is a glove that will last for many seasons to come. This 11.75 Inch model features a H-Web and is ideal for infielders. This model employs Easton's 2x2 lacing, which is a lacing system that gives twice as much strength in the key area of the web. 2x2 lacing prevents against blowouts and the need for relacing.